Brain arteriovenous malfunction. Coloured Magnetic Resonance Imaging (MRI) angiogram of a coronal section through the back of a brain showing arteriovenous malfunction (AVM). The patient, an 18 year old female, suffered this congenital defect from birth. The affected region is at centre right. The red area shows nerve tissue infarction (death) due to lack of blood supply. Abnormal blood vessels appear black and circular. 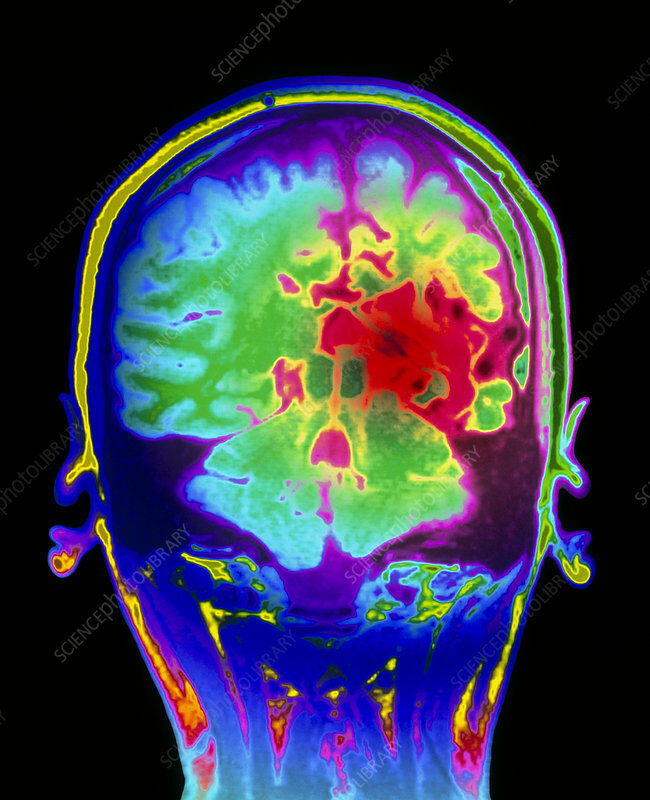 Normal brain tissue is green and light blue. AVM may be present at birth or can result from injury or disease. Brain function may be seriously impaired, leading to speech defects or paralysis.